This is the Artec Vintage Tube Booster Unit. The "VTC" is a built-in "Cure All" for tone junkies. First of all, this multi tasking unit features a push/pull on/off sending the unit to a bypass mode when you pull up on your knob. When in the down position, the knob functions as an Onboard Overdrive unit. With the knob at 0, it is a Flat Boost (no EQ change in your tone, but adds lots of Sustain, and Harmonic Boost). 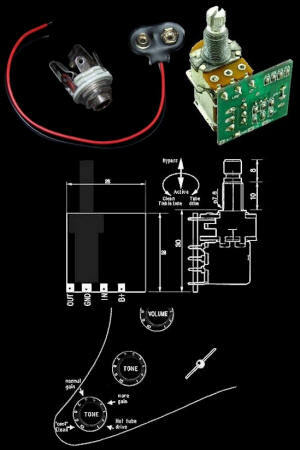 As you turn your knob up, you also increase the Gain of your guitars output, while at the same time it helps eliminate noise and delivers clear trebles, open airy midrange, and simulated vintage tube overdrive gain to your tone (like many foot pedals that can cost you hundreds of $$$)... Easy installation with any Passive or Active pickups in your Guitar or Bass (no modification needed, as it just replaces one of your tone pots). Powered by a 9v battery (1 battery can last more than 4000 hours!!!). You will receive the Unit itself, as it is pictured, with a Battery Clip, & Stereo Input Jack (incase the one you have on your guitar is Mono), as well as a wiring installation wiring diagram (very easy to follow).